The AfD is not the first far-right party in post-world war Germany, but it is arguably the most successful. Previously, German far-right parties were known as violent and extremist. They repeatedly failed to enter the mainstream and were sentenced to the political margin, at least on the national level. The AfD was founded in 2013, only month before the national election. The new party was founded by professors and economic elites, most of them with a Christian democratic background. The face of the party, co-founder, and designated co-speaker was Bernd Lucke, a professor of economics. Lucke occasionally used populist rhetoric, but substantially solely focused on the Euro. In the 2013 election, the AfD just failed to enter the Bundestag with 4.7% of the votes, but secured seven seats in the European election in the following year. Later that year, the AfD succeeded in regional elections in the Eastern states of Brandenburg, Saxony, and Thuringia, where they secured between 9.7 and 12.2% of the vote. 2015 marked a year of political turmoil for the AfD. Lucke was caught up in power struggles with its co-speaker Frauke Petry, the leader of the AfD’s chapter in Saxony and a representative of the right-nationalist wing of the party. He lost a vote for the principal spokesperson of the party at a party conference in Essen and eventually left the party. Some of the party’s more moderate faces followed Lucke’s example, and the party ideologically moved to the right in the eyes of the public. For a short time, the AfD dropped below the electoral threshold in national polls and seemed bound to join the fate of previous far-right parties in Germany. However, the European migration crisis fully reached Germany in the summer of 2015 and changed the public and political agenda. Most of the following state elections revolved around refugees and migration. The AfD responded to these events by focusing on migration and pushing hardline radical rhetoric. 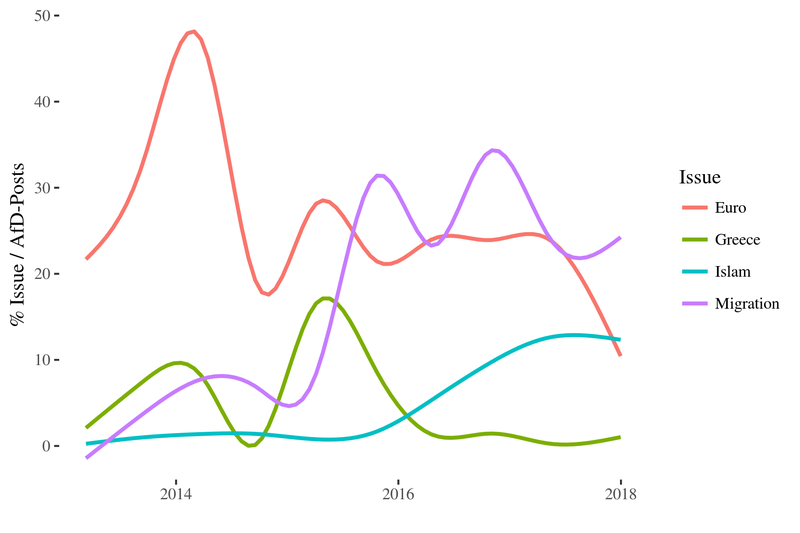 An analysis of the party’s central facebook fan page visualizes the ideological trajectory (Figure 1). Before spring 2015, the AfD’s facebook posts were mostly concerned with the Euro and in early 2015 with Greece. In the summer of 2015, migration jumped to the top of the agenda and was there to stay. Since 2016, we also observe a gradual increase in attention to Islam. By and large, the AfD has benefited from this move. The party is currently represented in 14 state parliaments. In all likelihood, they will also secure seats in the two remaining state parliaments of Bavaria and Hesse in October 2018. Like their predecessors on the far right, the AfD performs significantly better in East German states. In Saxony-Anhalt and Mecklenburg-West Pomerania, the AfD became the second largest party with 24.3 % and 20.8 %, respectively. While they just met the election threshold in most northern states, e.g., Bremen with 5.5 % and Schleswig-Holstein with 5.9 %, the AfD is anything but marginal in Western states. In Rhineland Palestine, they received 12.6 % of the votes and in Baden-Wuerttemberg 15.1 %, making them the third largest party in either state. In the 2017 general elections, the AfD received 12.6 % of the votes. That is the strongest first entry in post-war Germany, and the AfD became the third largest party, outpolling the left (Die Linke), the green (Bündnis90/Die Grünen), and the liberal party (Freie Demokratische Partei, FDP). The general elections revealed the same regional divide as we observed in the state elections. In Saxony, the AfD even came in first with 27 % of the votes and three candidates even won direct mandates. Beyond the former GDR, the AfD’s heartland, they polled well in Bavaria, Baden-Wuerttemberg, and some constituencies of the North Rhine-Westphalian Ruhr area. Figure 2 summarizes the regional differences in AfD support. Many of the areas with strong AfD support suffered from structural change. However, the AfD does not only thrive in deprived areas. Karsten Hilse (AfD) for example won the direct mandate for his district Bautzen 1. Unlike other areas in Saxony, the district Bautzen is economically very well off. In fact, it is one of the strongest in the East. While the driving factor behind support for the AfD is not necessarily real structural and economic deprivation, the perceived decline appears to be very relevant for AfD support (Table 1). At the AfD’s first press briefing, a day after the election, Frauke Petry announced that she would not be part of the party’s caucus. She told the assembled press that she wanted to steer the party onto a coalition course with the Union of CDU and CSU and that this is not possible with an “anarchic party”, she argued. The next day, she and a handful other AfD executives left the party. The notion of Petry as a moderate force, leaving the party over ideological differences is delusional. Petry’s move was the consequence of power struggles, not ideological dissent. A radical right party in the German Bundestag is a first and the change is certainly disruptive. The AfD needs media attention, more than any other party does. Thus, we can expect provocations and verbal barbs, as we already observe in many state parliaments. Twenty-eight years after the Germany reunification, there are still many regional differences, especially between East and West Germany. 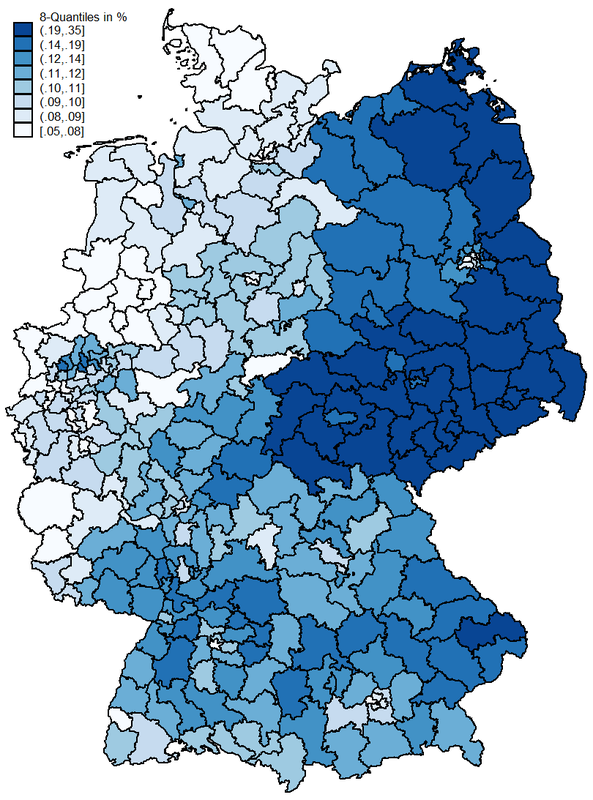 While the AfD is surely not just an East German phenomenon, they do disproportionately well in many East German constituencies. Catalyzed by the salience of the refugee crisis, the AfD also leveraged upon a grand coalition (the second under Merkel), which left many people disaffected and frustrated.